Listings go up and listings go down. But done deals don’t lie. 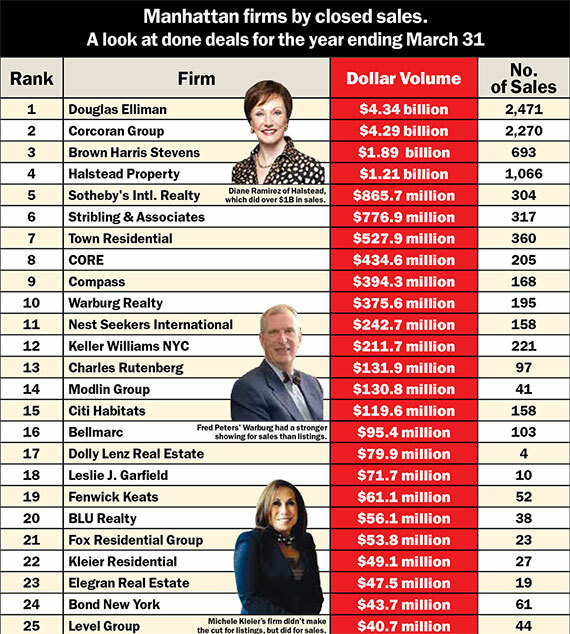 This year, The Real Deal’s annual brokerage ranking includes a list of New York’s residential firms based on their volume of closed sales. Like TRD’s other lists, the ranking relies on data pulled from On-Line Residential, and it includes closed transactions in Manhattan for which the firm held the exclusive sales listing during the 12 months that ended on March 31. Not surprisingly, industry heavyweights Douglas Elliman and the Corcoran Group trounced the competition when it came to the sheer dollar volume of deals. The two firms were nearly neck and neck, with Elliman closing a staggering $4.34 billion and Corcoran locking up $4.29 billion. Both of those totals were far higher than the tallies the two firms saw the last time TRD did this ranking in 2013. In that survey — which was based on closed deals in 2012 above $1 million — Corcoran came out on top, with $3.1 billion, while Elliman closed $2.4 billion. But this year’s higher numbers likely reflect the fact that the latest figures include closed sales at all price points and that the market is stronger, particularly for luxury properties. “In a good market, when you’re selling high-end real estate, sales volume will be higher,” said Elliman CEO Dottie Herman, citing record-breaking sales prices in Manhattan over the past year. “You can only sell them if there’s demand, and there’s still a demand,” she added, of the city’s luxury properties. With closed sales topping $1.89 billion, Brown Harris Stevens ranked No. 3, followed by Halstead Property, with $1.21 billion, and Sotheby’s International Realty, with $865.7 million. Collectively, the top 25 firms on this year’s ranking sold more than $16.5 billion worth of residential real estate during the 12-month stretch, according to TRD’s analysis. The city’s largest firms, not surprisingly, had the largest dollar volume of closed sales. However, a number of smaller firms — including some that didn’t make the cut on this year’s listings rankings, such as Kleier Residential — had far stronger numbers on the more crucial closed-sales front. In a year that saw buyers close on record-breaking deals — such as the $100.5 million condo at Extell Development’s One57 and the $80 million co-op at 834 Fifth Avenue — rising prices have boosted firms’ bottom lines. Brown Harris Stevens’ $1.89 billion in sales, for example, included some of the priciest deals completed in the past year. The firm’s biggest deal was the $70 million sale of Edgar Bronfman’s co-op at 960 Fifth Avenue to Egyptian billionaire Nassef Sawiris. The company also sold a $48 million co-op at 740 Park Avenue and a $37.5 million condo at 1 Central Park West. “Many firms are bigger than us, but we have the highest average gross commission. We dominate the high end of the market,” said CEO Hall Willkie. In addition to a strong luxury market, Willkie said BHS benefitted from adding 35 new agents, a hiring spree that brought its total Manhattan agent headcount up to 496. Beyond the city’s largest residential brokerages, luxury inventory and big price tags contributed to completed sales at smaller firms. Powerbroker Dolly Lenz’s firm, at No. 17, closed $79.9 million in sales, according to TRD’s research. An attorney for Lenz, however, disputed TRD’s data and said her firm closed “in excess of $600 million during the past 12 months.” That figure could not be confirmed and included buy-side deals, which TRD did not count. Meanwhile, Jed Garfield, president of Leslie J. Garfield, which ranked No. 18, amassed $71.7 million in closed sales, including the French government’s townhouse at 1143 Fifth Avenue for $32.5 million. “We didn’t sell more buildings, we did larger transactions,” Garfield said. Compass, which launched in 2013 and clocked in at No. 9, closed $394.3 million, according to TRD’s research. “Selling $400 million in less than one year since launching sales reflects the quality and growth of our agents,” CEO Robert Reffkin said. The firm’s priciest closed sale was the $17 million pad at 271 Central Park West to the actor Bruce Willis. Compass’ Jay Glazer represented the seller, Wesley Edens, founder of Midtown-based private equity firm Fortress Investment Group. With limited inventory, the fight for listings is intense. But once residential properties hit the Manhattan market, they fly off the shelves fast. The good news is that inventory is creeping up. During the first quarter, Manhattan’s inventory rose 5.5 percent to 5,243 available units, but that’s still well below the borough’s historical average, according to real estate appraisal firm Miller Samuel. With those market dynamics in place, perhaps it’s not surprising that a number of firms saw their total dollar value of closed sales eclipse their listings volume. “We sold a lot of apartments, therefore they weren’t on our active list anymore,” said Gary Malin, CEO of Citi Habitats, which ranked No. 15 for closed sales. Other firms had similar disparities between listings volume and closed deals. Town Residential had $437 million worth of listings as of March 29, but it closed $527.9 million in exclusive sales during the 12 months prior to that. Warburg Realty, which had $262.5 million in listings, sold $375.6 million. And CORE, with $277.5 million in listings, sold $434.6 million. “We work extremely hard not to overprice our exclusives and sell them quickly,” said Warburg President Fred Peters. He said Warburg had 100 exclusives in contract versus only 50 on the market as of March 29. Fox Residential founder Barbara Fox said the hottest segment of the market — “so hot you can’t touch” — is for two- and three-bedroom apartments in good condition and priced in the $1 million to $3 million range. “When they come on, they sell. It’s off the charts,” she said. Fox saw its listings tally drop to $36.7 million, however, it sold $53.8 million during the yearlong stretch. And Kleier Residential, which didn’t make that cut on the boutique list, ranked No. 22 here, with $49.1 million in sold properties. “I’m dealing with a lot of buyers as opposed to exclusives,” said company President Michele Kleier, who explained that in the past the firm focused on representing sellers. “We’re getting a lot of people who are looking first because they’re afraid they won’t find anything,” she added, echoing a point that Malin and others made. Even though big firms saw the highest total sales volume, smaller brokerages triumphed when it came to the average volume of sales per agent. The highest per-agent average was at the 10-person Modlin Group, which sold $130.8 million worth of real estate for an average of $13.1 million per agent. Among Modlin’s priciest deals was the sale of a $14.9 million penthouse at 150 Columbus Avenue. The firm is currently listing Demi Moore’s triplex pad at the San Remo for $75 million. Meanwhile, the 13-agent Leslie J. Garfield saw an average of $5.5 million per agent on its $71.7 million in closed deals. It’s worth noting that at the top, Corcoran bested Elliman. Corcoran’s 1,158 Manhattan agents averaged $3.7 million in sales, compared with Elliman’s 1,977 agents, who averaged $2.2 million. Still, many smaller firms are working their size to their advantage. CORE — with 119 Manhattan agents and $434.6 million in closed sales — racked up an impressive $3.6 million sales per agent. “We’re small but have a powerful footprint,” said CEO Shaun Osher. And with 281 Manhattan agents and $776.9 million in closed sales, Stribling & Associates logged in with roughly $2.7 million sales per agent.